We weren’t there because we gave up our season tickets this year. 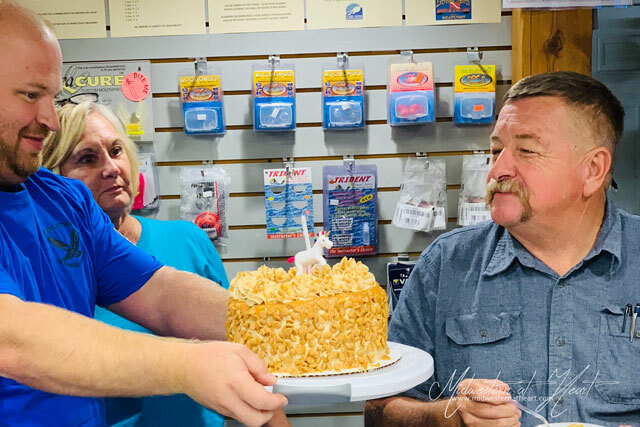 Since we weren’t there I made it a point to make Grady’s birthday cake for Dive Club Meeting last Thursday night. This was one of those cakes I debated over. Debated and debated. Grady likes Peanut Butter, but Deb had me worried I couldn’t make a Peanut Butter cake because it would be so dry. So I debated between a chocolate cake with peanut butter icing and a peanut butter cake. 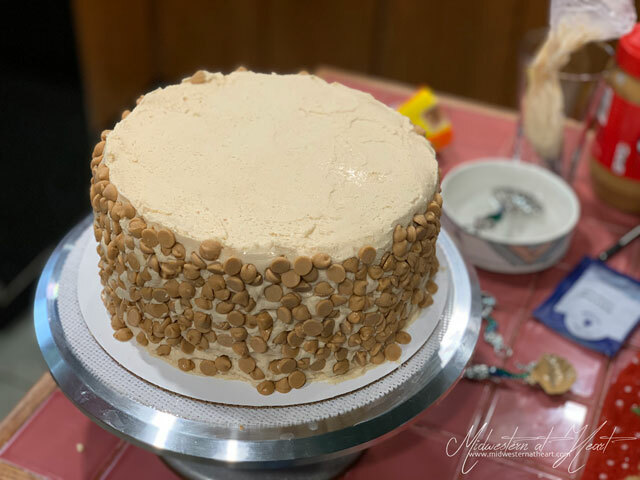 Back and forth, to and fro… I debated and debated and finally decided to go ahead and bite the bullet and make a Loaded Peanut Butter Layer Cake. 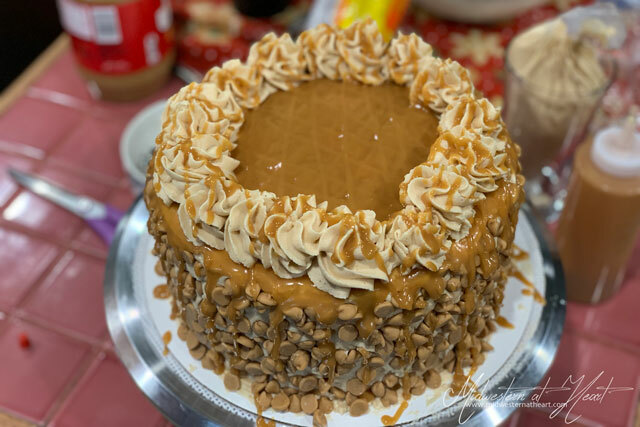 It was a peanut butter cake with peanut butter icing, peanut butter ganache, finished off with peanut butter chips. I have mentioned before in cake posts that I’m getting better at making flat cakes. 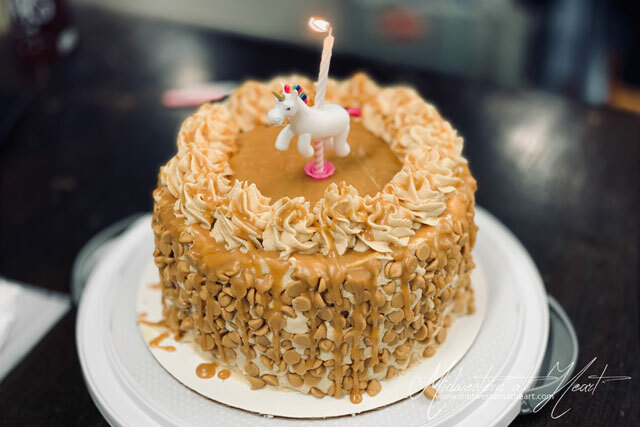 This peanut butter cake was no different. It did have a slight dome. 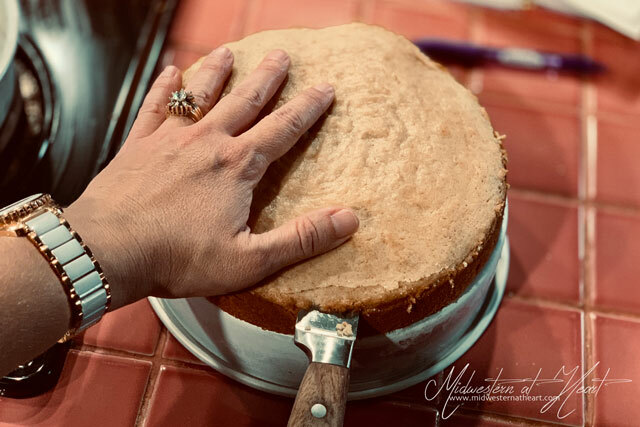 It wasn’t really bad enough that warranted actually cutting it off, however… I wanted to know if the cake was any good so I cut the dome off. Hubby, Abug, and I were pleasantly surprised. I also did something I usually forget… that part was putting the icing on the cake board to hold the cake in place. Truthfully, I really have never had the trouble keeping a cake in place, but I decided to try it today. Did I notice a difference? Not really. Like I said, I haven’t really ever had trouble with keeping a cake in place on a cake board… so… will I do it again? Oh, probably but if I forget, I won’t regret it. Now, in the past, I have covered the cake boards with aluminum foil. I don’t know why other than I was basically taught that when I took cake classes so I just did it. Recently I’ve quit doing that. I don’t know why… but I have… so… I guess as a side note if you want to be able to reuse the cake board, make sure you cover it in aluminum foil. Then when you’re done, peel the aluminum foil off and reuse the cake board. BAM! I followed the recipe to a T and kind of wished I hadn’t… Let me explain. The icing was where I had the problem. The icing was extremely, extremely thick. Holy cow. It called for 9 cups of powdered sugar. I think I would cut it back to 8 cups of powdered sugar. It won’t make it nearly as stiff. You don’t want it that stiff or else it doesn’t spread. I added a couple tablespoons of water to thin it out and just couldn’t get the consistency I wanted. It was a little frustrating, but by the time I was icing the cake, I was starting to run low on time. It’s fun to name ganache. I can’t lie. Who knew? 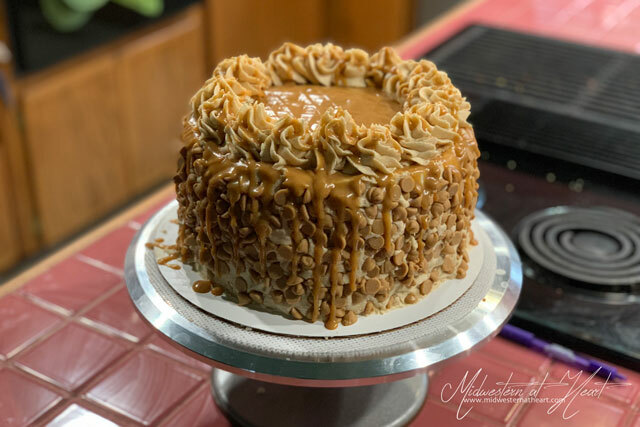 The cool thing about covering this entire cake in ganache and peanut butter chips is that you don’t have to worry if the icing is totally smooth. I think we surprised Grady :). And at first he wasn’t going try a piece but when he heard of all the peanut butter, he couldn’t stop. Now everyone laughs at the fact that I put a Unicorn candle on top… I couldn’t help it. That was the only candle I could find. So it was perfect, right? 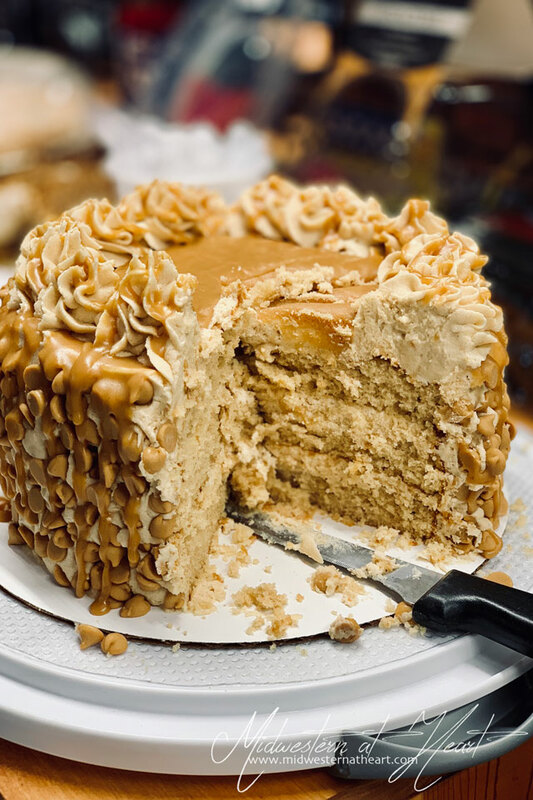 The other thing I need to tell you… I’m not a huge peanut butter fan and yet I thought this cake was pretty darn good. I much preferred the cake over the icing. But most days I’m not a huge icing fan anyway. 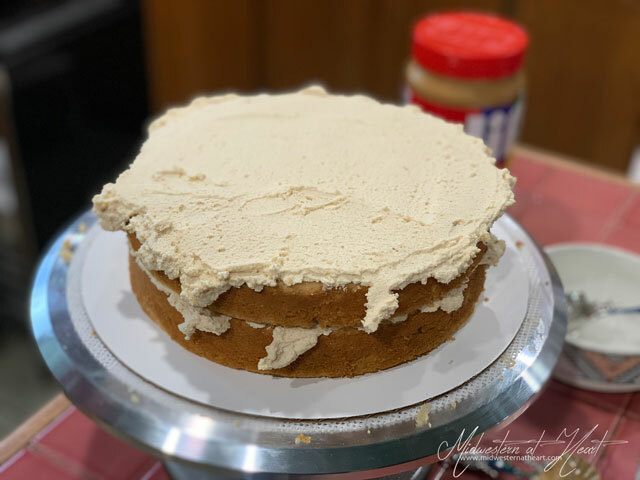 I could do cake without icing… unless it’s French Meringue Buttercream. I like French Meringue Buttercream. #truth! For the cake: Prepare the cake pans. This is for 3 layers, 8-inch cakes. 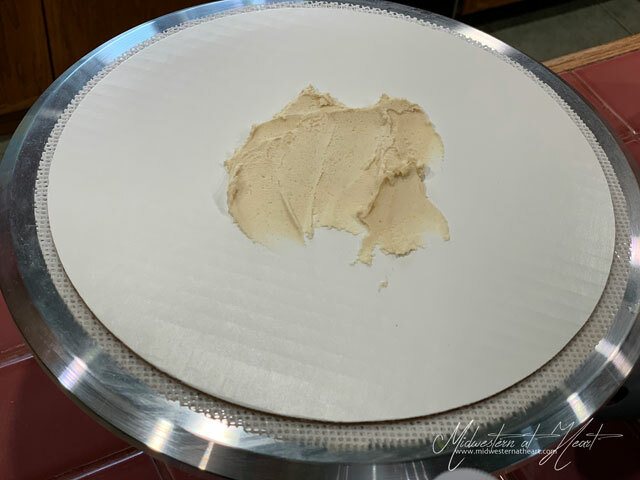 Line with parchment paper and use cake release on the sides. Preheat oven to 350˚F. 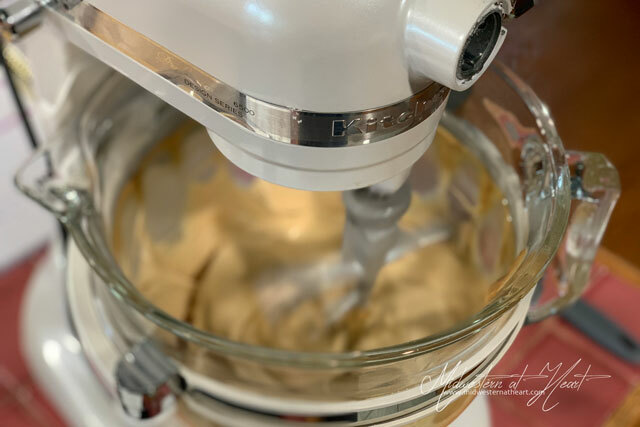 In the bowl of a stand mixer, cream the butter, sugars, and peanut butter together until light and fluffy, about 3-4 minutes. Add the sour cream and vanilla. Mix until thoroughly mixed. Add eggs one at a time, mixing well after each addition. Scrape sides of the bowl as necessary to fully incorporate ingredients. In a separate bowl, combine the dry ingredients, whisk together. In a separate bowl (or measuring cup) add the milk and water. Stir to combine. To the mixing bowl, add half the dry ingredients. Mix until just combined. Add in the milk/water mixture. Mix until combined. Then add the remaining dry ingredients. Scrape down the bowl as needed to fully incorporate ingredients. Divide the batter into the prepared cake tins. Bake for 21-23 minutes until fully baked and a cake tester or toothpick inserted into the center comes out clean. Remove from oven and allow to cool in cake pans for about 5 minutes before removing and allowing to cool completely on a wire rack. For the icing: In a large mixer bowl, beat the butter and peanut butter until fully incorporated and smooth, about 5 minutes. Slowly add half of the powdered sugar, making sure to mix until it is fully incorporated. Add 6 tablespoons of water or milk to the mixture. Slowly add the remaining powdered sugar until mixed smooth. Add additional tablespoons of water or milk until spreadable consistency. For the ganache: Place the heavy whipping cream into the microwave. Once brought to a boil, place peanut butter chips into the heavy whipping cream and place plastic wrap over the top. Allow to sit for 5 minutes. Then place in either a piping bag or a drizzle bottle. To assemble: Place a dab of icing on the cake board. Place the first layer of cake on the cake board. Spread a thin layer of icing over the cake layer. Repeat with the rest of the layers. On the outside of the cake place a thin coat of icing, a crumb coat. Put in the refrigerator for about 20 minutes or until firm. Then place a layer of the icing over the cake layers. Press peanut butter chips into the icing. Place the rest of the icing into a piping bag. With a 1M tip, place dollops of the icing around the top of the cake. Place the cake in the refrigerator for about 10 minutes or until cake is chilled. 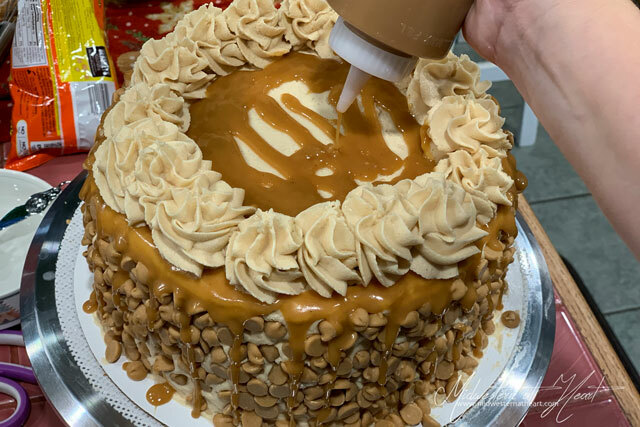 Drizzle the peanut butter ganache around the outside of the cold cake. Then fill in the top of the cake with the remaining peanut butter ganache. That looks absolutely amazing! You’re so talented!! !